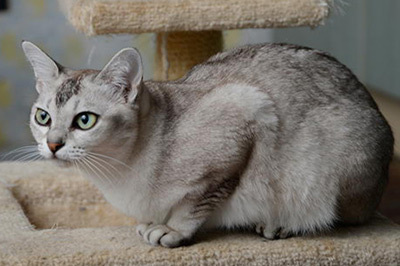 The Asian cat breed group has something for everyone - with five varieties to choose from! Burmillas, Asian Selfs, Bombays, Tiffanies, Smokes and Tabbies are all members of the Asian family. Related to the Burmese cat breed, the Asian must have a good temperament to conform to their breed standard - and they certainly live up to this! Naomi Johnson of the Asian Group Cat Society says: "Asians are generally very friendly and affectionate cats, they get on well with most other cats and I've sold a lot of kittens to homes with dogs. "They are quite lively, active and energetic cats, and I'd always recommend that if someone wants a kitten but will be out at work all day, that they should have two to keep each other company, ideally from the same litter. " Steve Crow, chairman of the Bombay and Asian Cats Breed Club, member of the Asian Group Breed Advisory Committee and chairman of the Governing Council of the Cat Fancy (GCCF), says: "Asians are very inquisitive and enjoy nothing more than being with their human companions. They are into everything - whether it's helping with the washing-up, investigating the contents of cupboards or sitting on a lap to watch the TV! "They are sociable and do not like being left on their own, and they enjoy playing with cat or people friends. They are good with children and are a confident breed. Asians are a delight to own, breed and show!" Burmillas are mostly silver or cream, while Tiffanies have medium length, fine coats and a lovely fluffy tail. Tabbies can be either ticked, spotted or have a 'mackerel' pattern. Smokes have a silvery white undercoat with a contrasting topcoat and, as their name suggests, Selfs come in a range of solid colours including blue, chocolate, red, lilac, cream, fawn and black, the latter of which is known as the Bombay. These shorthaired cats are the most low maintenance and need little grooming; a brush once a week or even just a hand groom will remove loose hair. Longer-haired Tiffanies do need a bit more grooming, although their coats are generally quite silky and a good groom once a week is fine using a comb with rotating teeth. Although its name suggests differently, the Asian breed of cat does not come from Asia. The Asian is a man-made breed, which originated with the Burmilla in 1981 after a Chinchilla and a Burmese mated and gave birth to four kittens. The kittens had short, blacktipped silver coats, black 'eyeliner', delicate tabby markings on the face, legs and tail, and strong but elegant bone and muscle. The breeder, Miranda von Kirchberg, embarked on a breeding programme with advice from fellow breeders to develop a cat of Burmese type, but with colour and pattern variations, aiming to produce a distinct pedigree breed capable of receiving GCCF recognition. Miranda and her colleagues soon realized they had the necessary gene pool to create a whole new group of cats, so the 'Asian' name was coined. Naomi says that a healthy kitten should have bright eyes with no sign of discharge, be lively, friendly and outgoing, show no sign of diarrhoea, and not look thin or lethargic, with a good appetite. Prices vary according to location, individual breeders and what's included (many breeders now include neutering and microchipping to ensure these are done before the kitten leaves them), so expect to pay anywhere between £400 to £500 for a pet quality kitten. It is also worth remembering that colours can take up to two years to develop. Steve, who is also chairman of the GCCF Genetics Committee, says that there have been very occasional instances of hypokalemic polymyopathy and flat-chested syndrome in the Asian breed, which have been inherited from the foundation breeds. A cat will only suffer from hypokalemic polymyopathy - a disorder that reduces potassium retention causing severe muscle weakness - if he inherits the recessive gene from both parents. Breeders are working to eliminate the disease using DNA testing to ensure that two carriers are not mated together. Flat-chested syndrome - which results in a kitten with a compressed, flattened rib cage that may result in difficulty breathing - is believed to be caused by a recessive gene or a complex genetic cause. It can be fatal in very severe cases, but in mild cases the condition may improve as the kitten grows.